(Nanowerk News) A prototype “green bus shelter” that could eventually generate enough electricity to light itself, has been built by a collaboration of University of Cambridge researchers and eco-companies. The ongoing living experiment, hosted by the Cambridge University Botanic Garden and open to the visiting public, is incorporated in a distinct wooden hub, designed by architects MCMM to resemble a structure like a bus shelter. Eight vertical green wall units – created by green wall specialists, Scotscape – are housed along with four semi-transparent solar panels and two flexible solar panels provided by Polysolar. 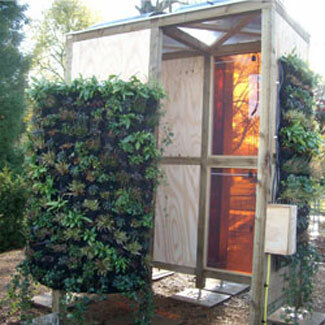 A prototype “green bus shelter” that could eventually generate enough electricity to light itself. The hub has specially adapted vertical green walls that harvest electrons naturally produced as a by-product of photosynthesis and metabolic activity, and convert them into electrical current. It is the brainchild of Professor Christopher Howe and Dr Paolo Bombelli of the Department of Biochemistry. Their previous experiments resulted in a device able to power a radio using the current generated by moss. The thin-film solar panels turn light into electricity by using mainly the blue and green radiation of the solar spectrum. Plants grow behind the solar glass, ‘sharing the light’ by utilising the red spectrum radiation needed for photosynthesis, while avoiding the scorching effect of UV light. The plants generate electrical currents as a consequence of photosynthesis and metabolic activity during the day and night. “Ideally you can have the solar panels generating during the day, and the biological system at night. To address the world’s energy needs, we need a portfolio of many different technologies, and it’s even better if these technologies can operate in synergy,” said Bombelli. The structure of the hub allows different combinations of the photovoltaic and biological systems to be tested. On the north east aspect of the hub, plants receive light directly, without being exposed to too much direct sun. On the south west orientation, a green wall panel is housed behind a semi-transparent solar panel so that the effect on the plants and their ability to generate current can be monitored. Next to that, in the same orientation, a single solar panel stands alone, and two further panels are also mounted on the roof. The green wall panels in the hub are made from a synthetic material containing pockets, each holding a litre of soil and several plants. The pockets are fitted with a lining of carbon fibre on the back, which acts as an anode to receive electrons from the metabolism of plants and bacteria in the soil, and a carbon/catalyst plate on the front which acts as a cathode. When a plant photosynthesises, energy from the sun is used to convert carbon dioxide into organic compounds that the plant needs to grow. Some of the compounds – such as carbohydrates, proteins and lipids – are leached into the soil where they are broken down by bacteria, which in turn release by-products, including electrons, as part of the process. Electrons have a negative charge so, when they are generated, protons (with a positive charge) are also created. When the anode and cathode are connected to each other by a wire acting as an external circuit, the negative charges migrate between those two electrodes. Simultaneously, the positive charges migrate from the anodic region to the cathode through a wet system, in this case the soil. The cathode contains a catalyst that enables the electrons, protons and atmospheric oxygen to recombine to form water, thus completing the circuit and permitting an electrical current to be generated in the external circuit. The P2P hub therfore generates electrical current from the combination of biological and physical elements. Each element of the hub is monitored separately, and members of the public can track the findings in real time, at a dedicated website and on a computer embedded in the hub itself. Margherita Cesca, Senior Architect and Director of MCMM Architettura, the hub’s designer, is pleased that it has garnered so much interest. “This prototype is intended to inspire the imagination, and encourage people to consider what could be achieved with these pioneering technologies. The challenging design incorporates and showcases green wall and solar panels as well as glass, creating an interesting element which sits beautifully within Cambridge University Botanic Garden,” she said.